This modern garden design in Islington, North London is a true outdoor living room, with a contemporary Mediterranean feel. 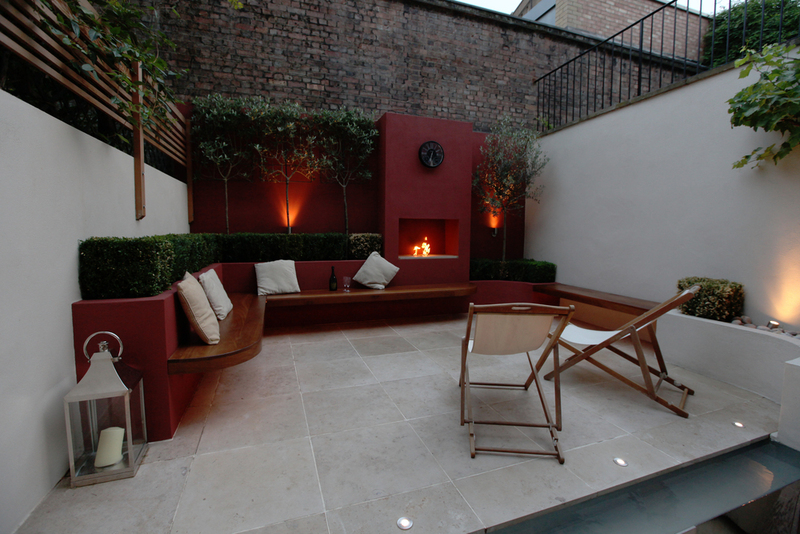 The design is centred around a fireplace built into the rendered and painted back garden wall. French doors open out onto the first level with access to storage on the left. To the right is a low planter with three Italian Cypresses (Cupressus sempervirens) at varying heights. Rosemary, lavender and sage and a tapestry of thyme are within easy reach for cooking. Steps lead up to the outdoor kitchen area. A stainless steel water feature ahead provides a visual focal point and aural tranquillity with a slow descending wall of water. There is a fitted gas barbeque cooker and worktop to the right for entertaining guests during warm afternoons and evenings. More steps rise to the main modern garden outdoor living space. A stainless steel rill runs along the front edge creating a simple clean boundary and water for the feature below. Rendered raised planters and hardwood benches surround the upper limestone terrace, with clipped box (Buxus sempervirens) for structural low maintenance planting. The outdoor fireplace adds atmosphere and a warm glow as the evening draws in. 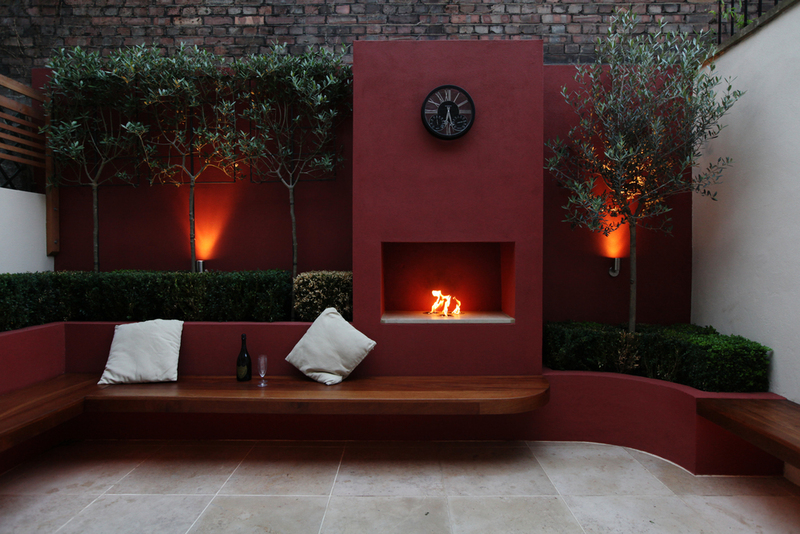 A dark red rendered wall encloses the space, with pleached Olives (Olea europea) and a mature edible grapevine (Vitis vinifera) to complete the Mediterranean mood of this modern garden design.